Spend a truly sensational and adventurous summer working as a Cruise Director, in charge of the Americas Cruise on the super-luxurious S.S. Liberty of the Waves! Arrange fabulous excursions to Mexico, the Caribbean, Rio de Janeiro and more! Visit pyramids, collect souvenirs, go on helicopter rides and glass bottomed boat tours. 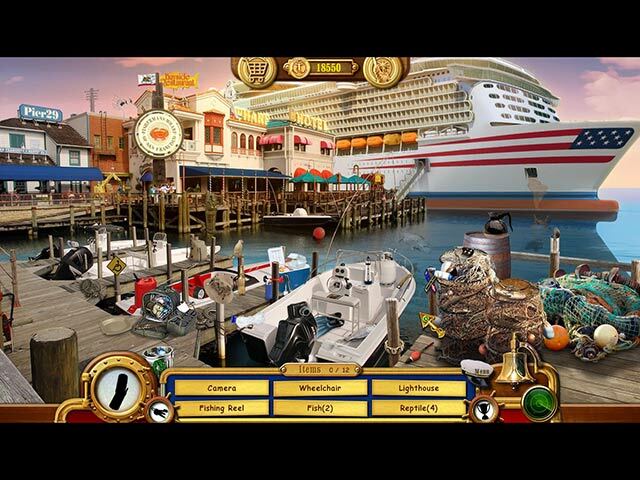 Help passengers, visit cabins, and search for hundreds of hidden objects. Organize on-board entertainment, evening shows, and relaxation activities. Earn merit awards for your special achievements! Vacation Adventures: Cruise Director guarantees a truly sensational experience with hour upon hour of gameplay for all ages to enjoy! Vacation Adventures: Cruise Director is rated 3.8 out of 5 by 28. Rated 5 out of 5 by dachsy from Become an Expert Cruise Director! An Excellent straight HOPA here which should not disappoint. Along similar lines to the excellent 'Park Ranger' games, but even better in some respects! Set on a cruise ship, you embark on a cruise as a would-be director. Good story line, excellent graphics with nice bright airy colours, fine ambient music which varies from scene to scene, and excellent mini puzzles, all help to make this an enjoyable game. There are two modes of play: Casual and Challenge. The challenge mode does not have sparkles, and hint button takes longer to recharge. Game is Full Screen. There are no voice overs, just written dialogue. However, that did not detract from the enjoyment of the game. The HOS are cleverly done, with some interaction. Some objects were well hidden indeed, and you have to be an 'eagle eye' to find them all. You earn cash as you play, and there is extra cash to be got if you 1]find all the 'Lost & Found' items, 2] find all the 'Recycle' items, 3] be an 'Eagle Eye' by finding all items without hints. You can spend your money earned on 'Souvenirs' at the cruise liner's Shop, and these are displayed in your special cabinet. There are also achievements to be earned. Between each HOS, there is a mini puzzle. In the demo hour, I come across four different puzzles. These were fairly standard 'swap the tiles to complete picture', 'rotate pieces to complete picture', 'find differences between two pictures' etc. About the 4th puzzle in, there was a clever variation on a jigsaw, where you had to place shapes to complete the deck layout, and thereby find where your particular cabin was. There are bonus points awarded for completion of mini puzzles, and I noticed there was a timer on these, so maybe you got 'eagle eye' points if you achieved it within time. There is an interactive map for scene replay and rewards. And this is a game that you will probably WANT to replay scenes in, as curiosity to what you may have missed first time around, encourages you to try and do better. Game looks to be a decent length, and is varied enough to strongly recommend. Rated 4 out of 5 by debbersgame from Lots to look for that's for sure This is a pretty good HOG. It keeps you busy looking for a lot of things at the same time. You are looking for items by their silhouette, by the list, and at the same time you are looking for recyclables; the goal being to find them all. Some of the items, especially the recycle items, are a little too tricky to see, but other than that I like that this is truly a HOG. You don't have to do a lot of extra stuff, like in a lot of the HOG games out there. There are quite a few little puzzles in between levels to do that provide a nice change of pace. I rated the visual/sound quality and storyline as excellent but I don't pay attention to the sound quality (play it muted) but the visuals were okay, and I never read the storylines. Overall, great game if you just like to look for stuff instead of all of the extra stuff a lot of the other games require of you. Rated 4 out of 5 by Dinkachu2492 from CRUISING to FUN with HIDDEN OBJECT GAME I was delighted to find a non-evil game to play! 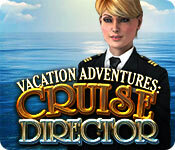 Cruise Director is a challenging and fun hidden object game. There are two levels of play - one easier and one more challenging - which makes it really appealing to purchase as less seasoned members of the family can also enjoy the game. The graphics are nice and bright. The storyline is a bit weak, but it is adequate. If you want a challenge, play the harder level. Rated 4 out of 5 by iou001 from Relaxing Stress-free Game This is my type of game. It's entertaining and easy on the eyes. The graphics are cartoonish but clear enough to see what you are looking for. And the story line isn't too bad either. I played it for about 10 minutes and knew I had made a good purchase. I highly recommend this game to beginners of HOGs and to those that like games that are not evil and dark. Rated 4 out of 5 by a41249 from Great Game for hog Lovers If you like the park ranger games you will like this game as well. You have lots of hog scenes then puzzles to solve. You have to pick up the litter and recycleables just like in the rangers games. I think this a good game if you enjoy lots of hog scenes. Rated 4 out of 5 by pennmom36 from All Aboard! If you enjoyed Vacation Adventures: Park Rangers (I certainly did) then you will be thrilled with this Adventure which takes place aboard the S.S. Liberty. You are the cruise director responsible for all activities and helping out the passengers, but, this isn't really an adventure game, it's a Hidden Object Puzzle game with just enough of a story to keep you interested. The Hidden Object games are packed full of items, some of which are blended into the scenery or within other items making them very difficult to spot, so don't expect a cake walk! Each scene has several items not on the list that are recyclable such as cans, paper or plastic bottles that you receive extra coins for when you click on them, and there is an icon that will show you which items you have found and which items need to be found (shown as silhouettes) Each scene also shows silhouettes of lost and found items in the porthole on the bottom left and you receive coins for those items as well (also an icon that shows items found and items that still need to be found as silhouettes) Some items listed in red are not in the open, for instance a fragile vase is actually inside of a crate simply stamped with pictures of breakable items. The coins you collect in each HOS can be used to buy souvenirs such as a Statue of Liberty replica. You are awarded coins and points are tallied up with the number of recycle items you found in that scene, the lost and found items found and if you don't have to use the hint, you get Eagle Eye points too. 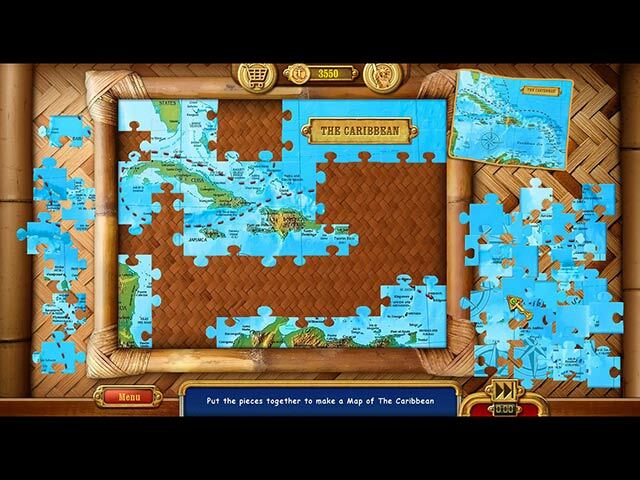 After each HO you get to play a mini game which is in the form of a puzzle, jigsaw puzzles, rotating several different sized squares to complete the picture and even a puzzle layout of the cabin placement that requires you to correctly place the shaped sections onto the outline of the cabin cruiser. You have to take this game for what it is to appreciate it, it's not the elaborate adventure games where you walk around a giant mansion picking up inventory items and using them to open secret compartments and hidden passageways, but it HOG heaven if you like to search for hidden objects at your own pace, enjoy! Rated 3 out of 5 by Ruckus777 from Has Its Issues To begin with what I liked about the game, I'll say that the visuals were, overall, very good. I thought the music was beautiful and fit the themes well. The cruise ship backdrops were spot-on and reminded me of all the cruises I've been on in the past. I thought the recycling/lost and found aspects were a nice touch. These were extra items in the game for you to find, such as a lost watch or an empty can to recycle. It gave the game an extra level of interest. Otherwise, I had a few issues with this game. I played this on easy, so I wasn't expecting a challenge. Yet, the hints and compass (?) recharged so fast that I easily breezed through the HOPs. (While the hint speaks for itself, the compass, when clicked, highlighted all the items you were looking for, even the recyclables/lost items, for a brief moment.) It was hard not to fall back on them to play the game for me. (Perhaps this wouldn't be an issue for others with better self-control, lol.) Also, I thought the HOP detail of items being behind other objects (like a ticket behind a pillow) felt random and unnecessary, turning it into a clickfest instead of a regular search. I also was looking forward to at least a bit of an interesting plot, but instead it was merely puzzle after puzzle, with the only motivation to collect "souvenirs" that served no purpose other than for decoration. I've never played the Vacation Adventures series before, so perhaps this is a staple of the games I'm not aware of. Still, it's not my preference. Overall this game just wasn't my cup of tea that had its issues. Rated 3 out of 5 by FreeBird01 from I was looking for a HOG that didn't have a dark theme And I really wanted to like this game. However, I found the hidden objects were harder to find than in the dark theme games. The story wasn't particularly interesting to me. I have never felt that there was that much to do on a Cruise ship so I guess this game proves me right. Rated 3 out of 5 by Linca1 from Good but not great Awerage on all points, except the challenge level, which was harder than average. 2 difficulty settings, pretty graphics, but noting that really stand out. Rated 3 out of 5 by pgobeli from It was just okay This game was okay. Graphics were pretty decent. It was just a little too sedate for me. I would recommend this game to beginners, not intermediate or expert level players. Rated 3 out of 5 by poynter from vacation adventures; cruise director Too many jigsaw puzzles, didn't want a puzzle game, Art work too fuzzy to make out some things. Not even close to the other two. Rated 3 out of 5 by ninda2 from Cruisin' I downloaded it as I love to take real cruises, so naturally I thought this might be fun, for me it had to many HOG, don't get my wrong I don't mind them but it was to many for me. Its a cute game and fun, something a change of pace from all the dark evil stuff on the HOG and adventure games. If you like a lot of HOG this is the game for you. Rated 3 out of 5 by mirror75 from Worth a free game or a big sale Very much like the Park Ranger series, although Park Ranger had better graphics in my opinion. 98% HOG with puzzles in between HOG's. It's great when you just want to HOG it up, not think to much. The graphics are pretty messy and cluttered which makes it more fun to find, but not more fun to stare at. It's neat that it seems there are real photos of lot's of people. A lot of the items are too grainy though. I'm ready to see a HOG where there are new and different in between puzzles and really crisp, sharp items. And one that has more to use your points on than just buying junk. The recycling and the shadow items are a great feature though. And there are lots of different scenes, they don't just continuously reply the same handful of scenes like a lot of other games do. Rated 3 out of 5 by kdeltakilo from This one is a pass for me First, what I liked. There are a lot of puzzles. After each HOG, there is a puzzle. The puzzles were easy, such as swapping squares to form a picture, or turning them to form a picture... or moving blocks to make the ship's map. They were easy, but I still enjoyed them. They did seem to be growing in complexity, so maybe in later stages of the game they are more challenging, but I didn't like the game enough to keep going. Now what I didn't like. There are objects hidden in red that are hidden inside or behind other objects, but you have to deduce which ones. There are no gears or hands to guide you. I think some people will really like that and others will find it annoying. I found it a little annoying, but I also found it easy to figure out. There are also objects in blue that have to be moved and joined to other objects. Again, you have to deduce which ones. This makes it more challenging, but whether that's a good thing or a bad thing will depend on the person playing. They do have sparkling areas, but those are just zoomed-in hidden object games. At first I thought the graphics were going to be crisp, but that was deceptive. Some objects were so poorly defined, I had trouble telling what they were. I also don't like HOG that are all clutter, and this is all clutter. Items can be well hidden without clutter. I can't recommend it. Try it for yourself, though. It may be that even though it's a no-go for me, you may like it. Rated 2 out of 5 by heatherceana from Not for Epileptics This game has excellent potential. Sadly, as soon as you reach the match game, they decided to make each card you choose (always 2 at a time) flicker incessantly before turning back over. This makes the game not well suited for people with epilepsy. Sadly, I will not be able to recommend the game. Rated 2 out of 5 by hibc60 from glad to see others that didn't like this one I started it and wanted to like it but just got board and gave up. hard to say why but nothing interesting to do, finding things took too long and got tired and board as I said so gave up. maybe if it gets updated I will give it another try but not interested right now. Rated 2 out of 5 by mrm2006 from Another Vacation Disappointment So, this time we're off on a cruise but, that's where the fun ends. The graphics were horrible. Oh, don't get me wrong, the colors were all very pretty as were the moving bulletin boards. No voice overs - in this day and age? What I Liked: Hmmm. Nothing. Wait! Unlimited hints that recharged quickly. I needed them. The demo ended. What I Disliked: Well, of course, EVERYTHING about this game is one big HOG and, therein lies the problem. The items were so small or so impossibly blended in that they were impossible to find without resorting to the old "point and click" routine. Also, tooooooo many items in one area to find 12. I get this is an HOG, but is it supposed to be a stressful, unenjoyable one? While the mini games were enjoyable, to a degree, I did not see a skip button. I cannot play those slider puzzles and could not find a skip button anywhere. Am I forced to play puzzles I simply can't? And is it necessary for the constant blinking in another HOG? Hurts some people's eyes, you know. We are instructed early on that where the sparkles are, we will find an object. So, sparkles in a bakery, found an object. Sparkles come back, can't find anything. Click on it repeatedly, still can't find anything. Clicked on the hint (also all the time) was directed to the sparkles. Clicked on the hint while in the sparkled area and it bounced me out. Yet, the sparkles continued even after I finished the level. Hmmm. There was no sense of flow or direction. A pop-up box that said this is where you go to do this or that and, presto-chango - you are there doing another impossible HOG. It appears that there is a mini game after every 2 or 3 levels. For what purpose, I don't know. There is no sense of direction in this game. And, I've never been on a cruise before so one of the mini games was almost impossible for me to figure out - took a LONG time. You can buy souvenirs, yay. I've always wanted to go on a cruise, but I'll skip this one. It wasn't entertaining or enjoyable in the least. This "vacation" game is another dud for me. Not a purchase for a ton of reasons. Rated 1 out of 5 by Terface52 from Just awful! I played the demo for 10 minutes. That was all I could take. Boring, boring, boring. If you like HOGs with static screens and no story line, then this game is for you. Otherwise, forget it!